SAN JOSE, Calif. (KGO) -- Two churches in San Jose that offer its members marijuana are being scrutinized by the city. Authorities say the churches are fronts for illegal dispensaries. Inside Coachella Valley Church you'll find pews, an alter and pictures of Jesus. But you'll also find lighting up is encouraged. We asked volunteer Sebastian Grey if it was a dispensary. He replied "We're a church." 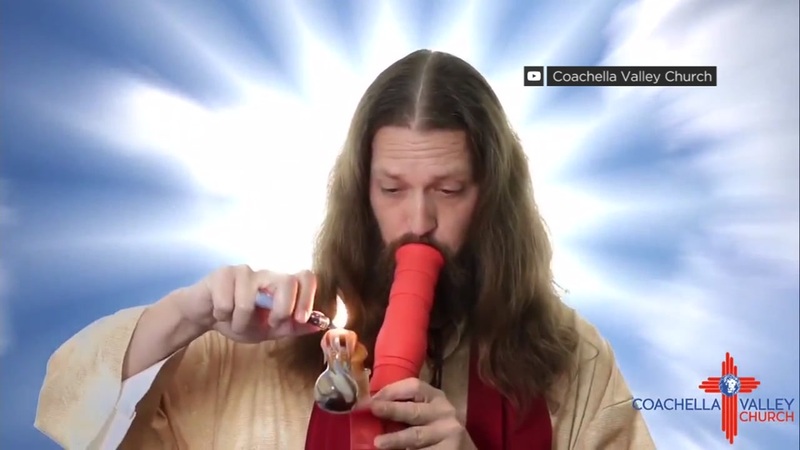 Coachella Valley treats cannabis as a sacrament and says it is used here for religious purposes. "It's just a 10 dollars donation to be part of the church and then you're a lifetime member... you're able to show your ID we'll get you checked in and you can go in the back, purchase products," said Grey. Inside there's a lobby with a receptionist who is checking people in. They must be at least 18 years old. After paying a donation, they are ushered into a chapel with pews where a video of a sermon is playing. We were not allowed into the room where marijuana products were being offered. We spoke to a woman visiting from Colorado who just signed up to be a member. She bought two bottles of cannabis labeled as sativa. We asked how much they cost. She told us it cost 100 dollars for a quarter of sativa. City officials have been investigating Coachella Valley Church as well as Oklevueha Native American Church also known as ONAC. No one would talk to us there, but it also offers cannabis. City officials say it's illegal to sell or distribute cannabis without proper permits. "Whatever their followers want to smoke that's not the issue it's the distribution and sale coming from the dispensary the church issue just doesn't fly" said Rick Doyle, the city attorney for San Jose. The city only allows 16 marijuana dispensaries to operate. Each pays 10 percent of its gross sales. Since neither church is permitted, it's not paying taxes to the city. Doyle said a judge just signed an injunction to stop operating within the next 10 days. He said the city also plans on doing the same with Coachella Valley church.